In 1943, a dispute erupted between West Hartford residents and federal housing officials over whether or not African Americans should be allowed to live in the World War II public housing tract called Oakwood Acres. During this period, public housing tracts were created to shelter the many war workers and their families drawn to the Hartford area by the availability of defense-related jobs. The United States government funded these developments; therefore, local housing officials needed to abide by federal laws regarding occupancy. Federal Housing authorities eventually did require West Hartford to admit African Americans; however, town residents and leaders prevailed by specifying residency criteria in such a way as to maintain the demographic makeup of their virtually all-white community. Racist actions such as these, even when they occurred decades ago, have been factors in shaping the present-day demographics of West Hartford and other towns in the state. The advent of World War II brought significant changes to a country that had been in the grip of a deep financial depression. Across the nation, as people moved into cities looking for jobs in wartime defense industries, demand for housing soared. Often, that demand far exceeded the availability of properties to purchase or even rent. In 1940, President Franklin D. Roosevelt and the United States Congress established the United States Housing Authority (USHA) and authorized it to build public housing units with the goal of providing adequate living quarters for war workers. An influx of war laborers, both white and African American, and their families came to the greater Hartford area in the 1940s. They worked in defense factories, such as the Pratt & Whitney Machine Tool plant and the newer Pratt & Whitney Aircraft Company. As a result, housing options were limited in the Hartford area. By August of 1943, 8,000 new housing units had been developed in Hartford and New Britain to accommodate the growing population. 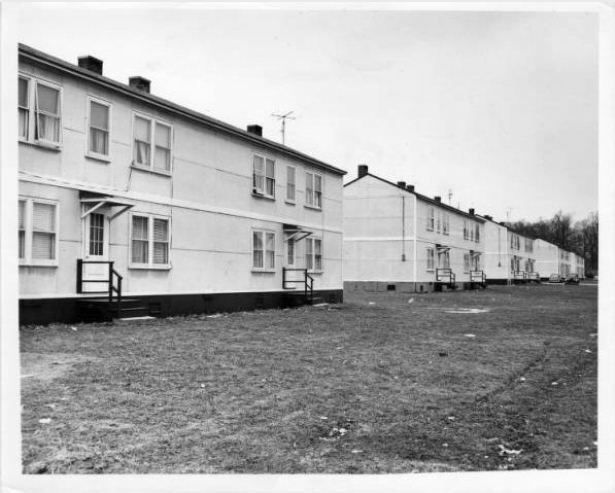 These apartment-style homes were built under the Hartford Housing Association (HHA) and paid for with federal funding from the USHA. One unit developed under the HHA was the Oakwood Acres Housing Tract. Located on Oakwood Avenue in West Hartford, it spanned the area between St. Charles Street and Seymour Avenue. Contemporary descriptions present the Oakwood Acres’ living spaces as new, simplistic, and affordable. In 1943, only 14 out of the 300 apartments in the building were occupied at a time when many African Americans either had no place to live or could only find substandard accommodations. The federal government planned to use the complex to provide housing for these workers and their families. Furiously, homeowners wrote to the HHA and West Hartford Housing Authority (WHHA) asking if African Americans would indeed be admitted to Oakwood Acres. When the Hartford Courant posed the question to WHHA chairman Richard F. Jones, he equivocated, saying, “I won’t say we are and I won’t say we’re not going to admit Negroes…. At the present time that is a topic we’d rather not publicize too much.” This prompted West Hartford residents to send petitions to their senators, Francis Maloney and John A Danaher, and congressman, William Miller. Miller responded that he would look into the issue. The United States Housing Authority responded with an ultimatum. They stated that it was unlawful to exclude occupants from Oakwood Acres based on race. Local housing officials were advised that unless the race restrictions were lifted, the federal government would step in. Under this decision, African Americans would be admitted if they applied for a unit. This angered many West Hartford homeowners, prompting the town’s housing officials to find a loophole. They decided to accept applications only from “Negroes with essential West Hartford industry jobs.” Officials made this ruling knowing that, at the time, only six African American families fit this criterion—and they had not expressed interest in living in Oakwood Acres. Ultimately, with this restrictive technicality in place, no African American war workers moved into the housing tract. The white West Hartford housing officials and their supporters had trumped the federal government. They found a way to circumvent federal guidelines and discourage African Americans from living in publicly-funded housing with the town’s borders. 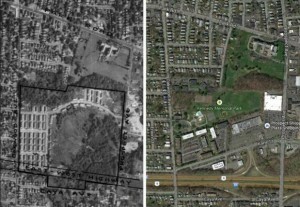 In 1956, Oakwood Acres was demolished. 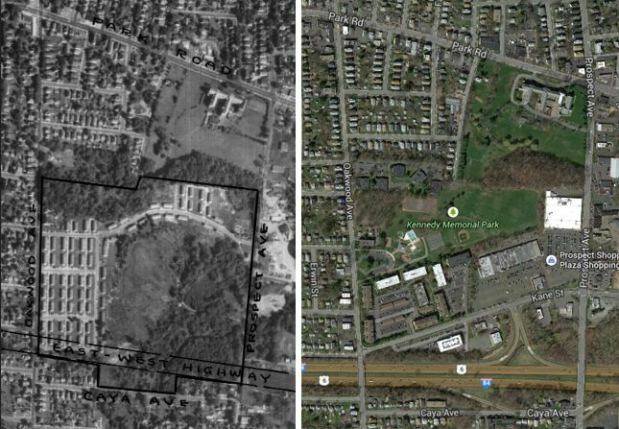 It had become dilapidated and the people of West Hartford feared it made their neighborhood look like a “slum.” By destroying the unit, West Hartford also erased the physical remnants of this racist chapter in the town’s housing history. Today, West Hartford remains a predominately white community. One can argue that its demographics have been shaped, in part, by discriminatory housing practices of which the standoff over Oakwood Acres is but one example. Emily Meehan, a sophomore at Trinity College during the 2013-2014 academic year, is an Educational Studies major and a resident of Duxbury, Massachusetts. Dougherty, Jack, and colleagues. On the Line: How Schooling, Housing, and Civil Rights Shaped Hartford and Its Suburbs. Hartford, CT: Trinity College, 2011. Link. Szylvian, Kristin M. “The Federal Housing Program During World War II.” In From Tenements to the Taylor Homes: In Search of an Urban Housing Policy in Twentieth-Century America. University Park, PA: Pennsylvania State University Press, 2000. “1877 Worker Visits New Tool Plant.” Hartford Courant. August 14, 1943, sec. ProQuest - Hartford Courant Historical Newspaper database - Available through iCONN.org. Link. “Housing Official Noncommittal on Racial Question.” Hartford Courant. October 21, 1943, sec. ProQuest - Hartford Courant Historical Newspaper database - Available through iCONN.org. Link. “Housing Reaches 8000 Mark in City and New Britain.” Hartford Courant. August 14, 1943, sec. ProQuest - Hartford Courant Historical Newspaper database - Available through iCONN.org. Link.